Cinnamon Bark (Rou Gui) or Twig (Gui Zhi) Most people are familiar with cinnamon as a culinary spice or natural flavoring, but a variety that is less familiar here in the West is the one known as Chinese cinnamon. This is the specific type of cinnamon referred to as "Chinese" cinnamon or Rou Gui in Chinese herbalism. 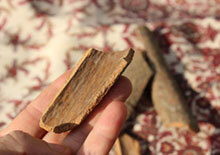 It is commonly found in thick pieces rather than the typical "cinnamon stick" or rolled up quill. The other variety is called cinnamon twig or Gui Zhi, which is derived from the branches as opposed to the trunk itself.